If there was ever any doubt, it should be completely erased by now. The American Republic is a nation at war. The war is extremely one-sided at the moment because it’s being conducted in a highly covert, asymmetric and stealthy manner. In this way are the globalists methodically picking off the patriots, both person and property. The biggest problem about this rapidly intensifying clandestine war is that the vast majority of Americans don’t even know they are being routinely attacked. Even when many are attacked in broad daylight, most refuse to consider the likelihood that their community was just wiped out by the New World Order globalist cabal. 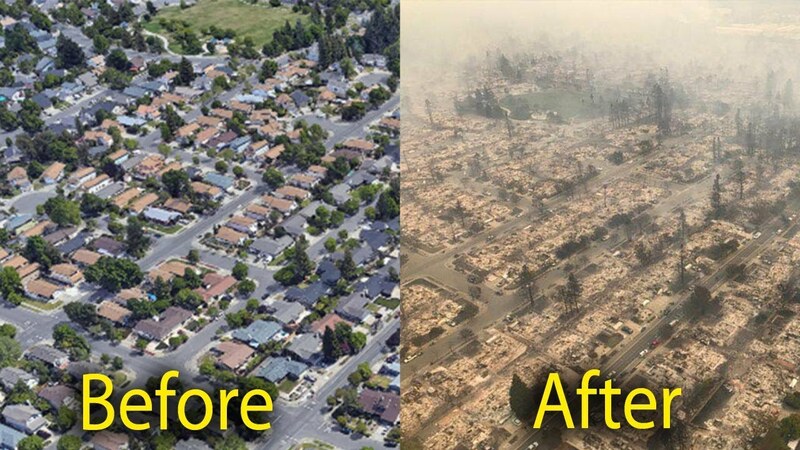 California’s geoengineered firestorms proved beyond a shadow of a doubt that the U.S. citizenry is being systematically killed by highly advanced weaponry. They really have no clue as their homes are demolished and businesses annihilated. Some of these sophisticated weapons are referred to as Directed Energy Weapons or DEWs. Evidence also points to some of them being laser-based while others may be scalar wave weaponry. Not only does the hard evidence on the ground reflect this relatively new reality, the anecdotal evidence also paints a truly harrowing picture. Of course, the circumstantial evidence of these calamitous attacks overwhelmingly points to a force that has usurped all levels of command and control within every government entity responsible for the security of the United States of America and safety of the citizenry. With so much scientific proof now widely available, it ought to be quite easy to compel the U.S. Federal Government to arrest and prosecute the NWO cabal behind so much death and destruction. Why then is there no traction to get to the bottom of these regular invasions? In this digital age there really are no secrets. Everything that goes on in the world has a digital record. These particular attacks throughout California produced damage so profound and pervasive that the perps inevitably left their fingerprints all over the place. Therefore, what’s now needed is the allocation of investigative and prosecutorial resources to ferret out the traitors among US. These attacks in California simply could not have taken place without the tacit approval of the California State Government. Given the total control over American airspace, the rogue elements within the federal government are also quite obviously complicit. The following video demonstrates just how broad and deep this conspiracy must be to take down the whole state of California. The preceding video indictment cannot be refuted by anyone. 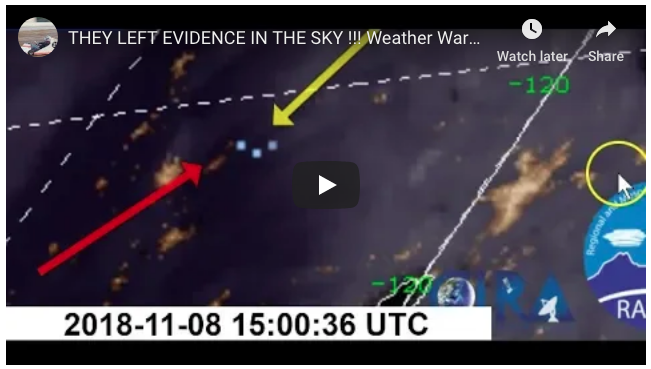 It contains so much evidence of destruction directly caused by Directed Energy Weapons that many at the federal, state and local levels will have a LOT to answer for. That the ever-prevaricating Mainstream Media (MSM) has deliberately not investigated the true causes of any of these catastrophic fires is especially telling. In point of fact, their extremely negligent reporting during this entire California wildfire season (as well as previous wildfire seasons) indicates that every major MSM news outlet is colluding with the enemy to keep these attacks covered up. Hence, the Mainstream Media really is the enemy of the people, as the POTUS truthfully proclaims. Whereas President Trump is absolutely right: the Mainstream Media is the real enemy of the American people, they must now be dealt with decisively before the citizenry has been rendered powerless. Many folks have already been socially engineered into a state of extreme impotence. Not only that, many of the same people have been brainwashed to support the criminal cabal. 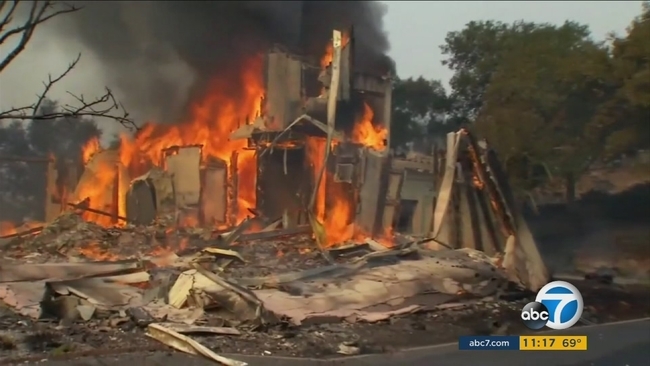 DEW signature: Yet another California home burns to the ground with all the trees around it still standing. 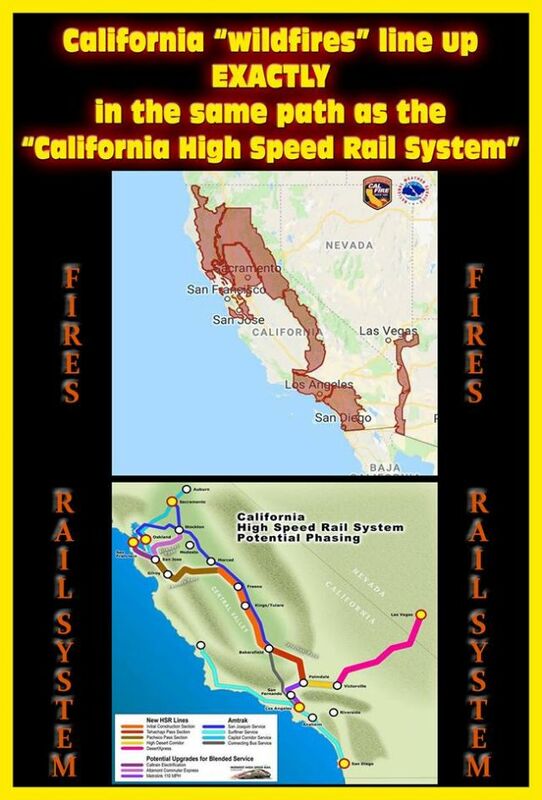 Graphic below posted at: Are the CA fires being intentionally started in regions of the state sleighted for the California High Speed Rail?